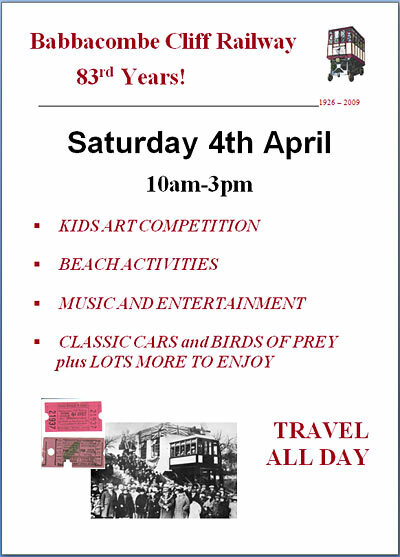 Babbacombe Cliff Railway 83rd Years! 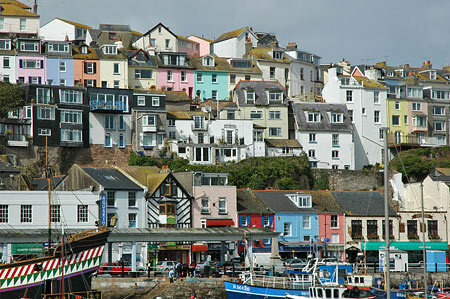 Author FunimagPosted on March 26, 2009 March 26, 2009 Categories Great-BritainTags Babbacombe, Devon, EnglandLeave a comment on Babbacombe Cliff Railway 83rd Years! 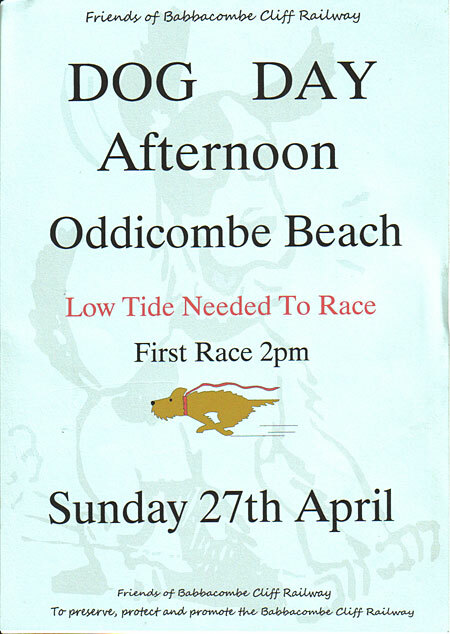 The Friends of Babbacombe Cliff Railway (FBCR) are organising dog races at low tide during the afternoon! Les Amis du Babbacombe Cliff Railway (FBCR) organisent des courses de chiens, à marée basse, durant l'après midi de cette journée du chien! Follow this tag for Babbacombe Cliff Railway in Funimag. 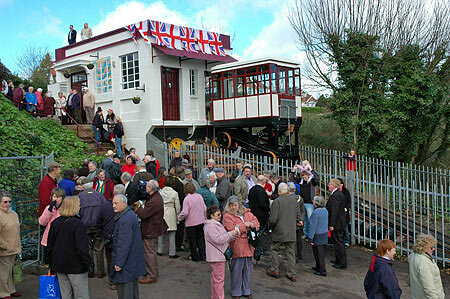 Suivre ce tag pour Babbacombe Cliff Railway dans Funimag. 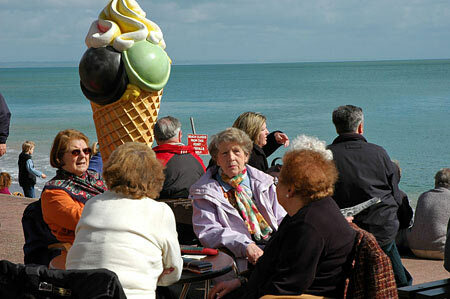 Torquay (Devon, England), April 1st 2006.Last Saturday April 1st 2006 was the 80th anniversary celebration day of the Babbacombe Cliff Railway. 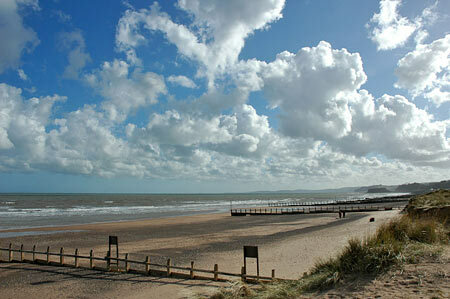 I was informed by David Cooper (LECS) and I decided to spend the week end in Torquay to be present at this event! I took the flight Paris-Exeter on Friday evening.The Cliff Railway was taken out of service on September 30th for a complete revision and for the refurbishment of the two carriages. It was supposed to reopen on April 1st 2006. 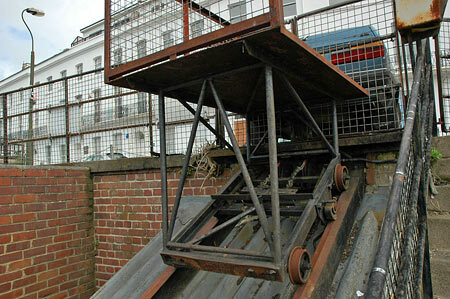 Unfortunately, some days before, the hauling rope failed and one carriage rolled down to the bottom of the hill. 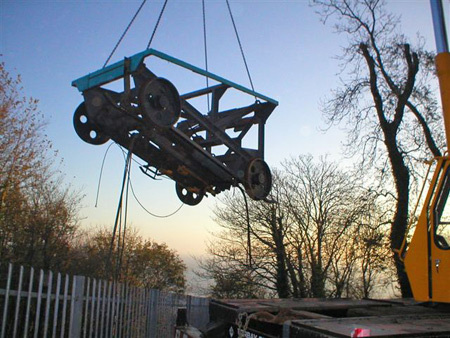 The chassis was damaged and the car was removed to be repaired. 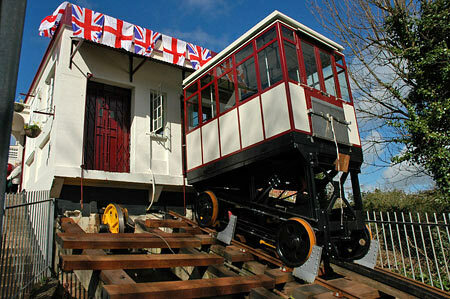 In spite of this accident, the 80th anniversary celebration day was not postponed. The funicular was out of order with only displayed car. I thanks Judy and John Ayres, Mr & Mrs J. Dann and Arthur Christian from the Friends of Babbacombe Cliff Railway for their humour and kindness! Continental funicular carriages are mostly equiped with overspeed brakes which are jaws which squeeze a rail in case of overspeed of the carriage… the carriage can stop in a few meters only! 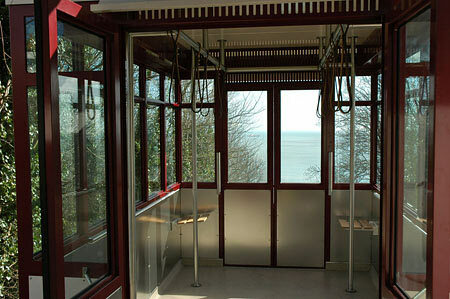 What about such a brake on Babbacombe Cliff railway carriages? Is there an emergency brake on the carriages? I see that there is some kind of third rail between the two rails… is there any overspeed brake on this third rail? If so, why this emergency brake did not operate when the carriage rushed down the slope? 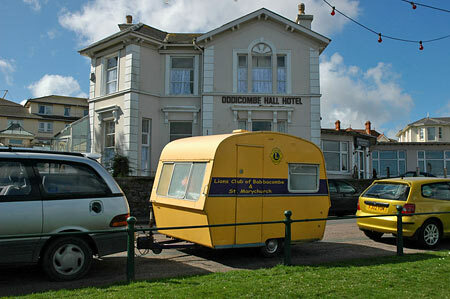 Torquay (Devon, Angleterre), 1er avril 2006. 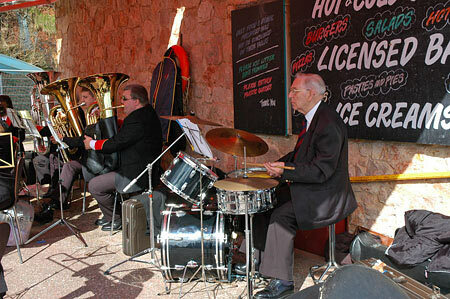 Samedi dernier 1er avril 2006 a été célébré le 80 ème anniversaire du Babbacombe Cliff Lift. J’ai été informé de cet évènement par David Cooper (LECS) et j’ai décidé de passer le week end à Torquay pour être présent. J’ai pris le vol Paris-Exeter du vendredi soir. 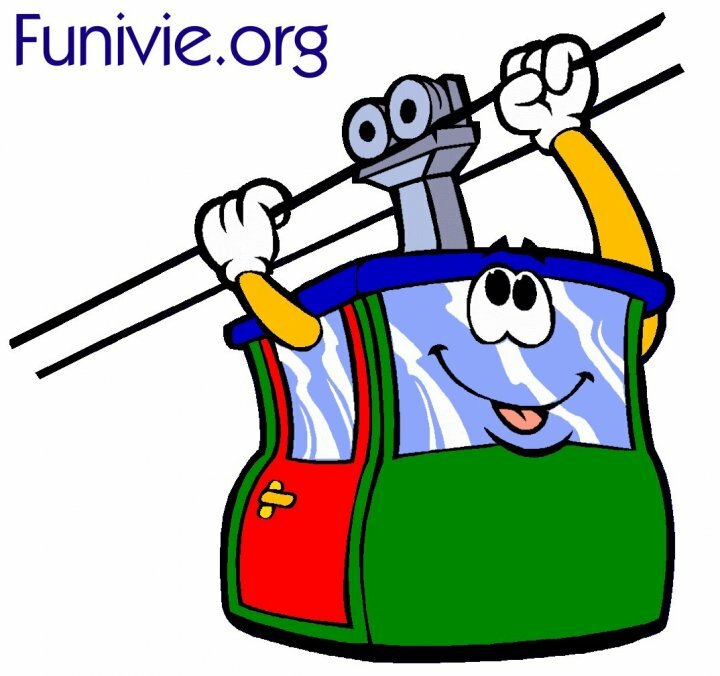 Le funiculaire était arrêté depuis le 30 septembre 2005 pour une révision complète et pour la rénovation des deux voitures. Il devait être remis en service le jour de son 80 ème anniversaire malheureusement quelques jours avant l’inauguration le câble porteur eut une défaillance ce qui provoca la chute d’une voiture qui vint heurter la gare basse en endommageant le chassis de la voiture. La voiture endommagée fut enlevée pour être réparée. Malgré cet accident, la cérémonie d’anniversaire eut lieu mais avec une seule voiture était présente et bien entendu le funiculaire ne fonctionnait pas. 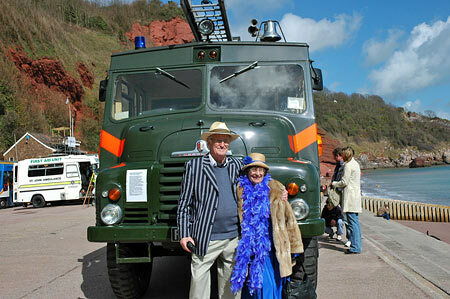 Je remercie plus particulièrement Judy & John Ayres, Mr & Mrs J. Dann et Arthur Christian des Friends of Babbacombe Cliff Railway pour leur humour et gentillesse. Les funiculaires continentaux, en majorité, sont équipés de freins parachute qui consiste en de fortes mâchoires qui viennent automatiquement serrer un des rails en cas de survitesse d’une cabine, ce qui permet à calle-ci de s’arrêter en quelques mètres seulement. 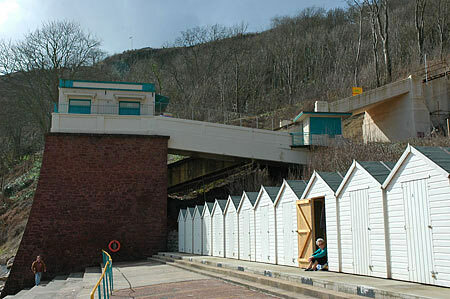 Est-ce qu’il y a de tels freins sur les cabines du Babbacombe Cliff railways? Il y a une sorte de troisième rail entre les deux autres rails, est-ce qu’il y a un système de sécurité qui utilise ce troisième rail pour arrêter la voiture en cas de survitesse. Si oui, pourquoi n’a-t-il pas fonctionné lorsque le voiture a dévalé la pente? 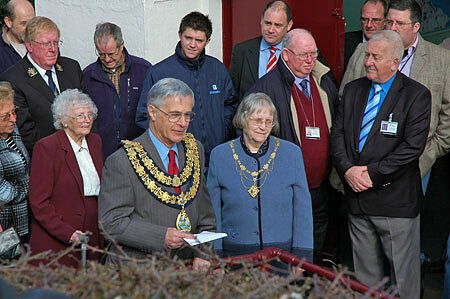 Rev Peter Killick Chairman of Torbay Council during his opening speech. On his right, Phyllis Tillman who was at the first opening in 1926. The top station with one of the new carriage. Interior of the new carriage. 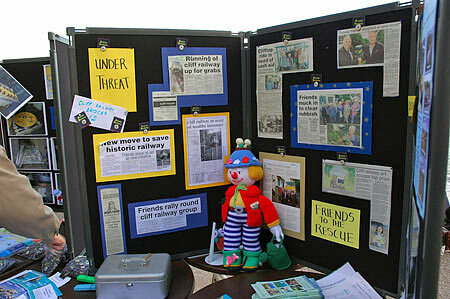 Friends of Babbacombe Cliff Railway (FBCR) stand. Vintage exhibition on Oddicombe beach. Surprise! 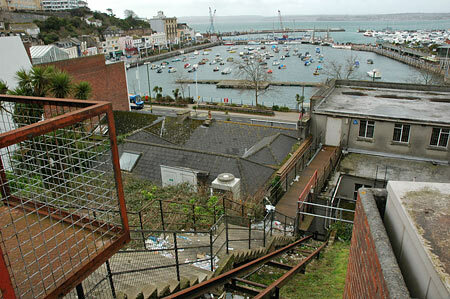 A cable incline in the very center of Torquay! 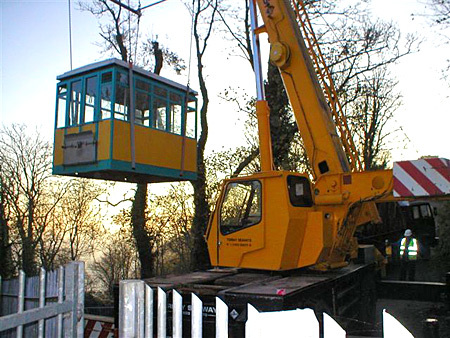 Humm… a real english cliff lift!